I have a set of backup scripts (executed via a nightly cron process) that dumps the database for each of my applications, which are in turn archived, and then downloaded to my server. Shared assets, those files uploaded via your application typically located in the public folder, are synced to my server and then archived. As my source control is hosted on Github, I don’t need to worry about backing this up. Monitoring services such as Apache, MySQL or even processes that are apart of your application, such as the Ferret server can be monitored by Monit or God. If these services go down unexpected, they are automatically restarted by the monitor. Performance Monitoring can be broken down further into Server and Application Performance. Munin is a good candidate for the first, while service providers such as New Relic and Scout are good for the later. With Server monitoring you will also want to consider the consumption of resources. For example, how much disk space do I have left? How much RAM do I have left? An external monitoring service is useful. Services such as Monstatic, 24×7, or Pingdom can notify you when your server is inaccessible. Finally, the Exception Notification plugin suits my needs to be notified of an exception, but you may prefer a service to manage this such as Airbrake Bug Tracker or Exceptional. Sometimes you will need to run scheduled jobs against your application such as managing recurring subscriptions. Make sure these are installed and running. It’s best to make these a part of your deployment using whenever or again, my preference is using Moonshine. If you are you are using ActiveRecord-based sessions in your application, then you will definitely need to setup a task to remove old records in the sessions table. Summary: Focusing your website on key customer tasks maximizes your budget and lead generation. I position myself as a Ruby on Rails developer in Montreal for database web applications. However, I often have to put on other hats for a project, depending on the budget and the team members involved. In the case of Dwayne Brown Studio, I was responsible for not only the programming of web pages and custom content management system, but I was also responsible for the visual design, interaction, and architecture of the site. 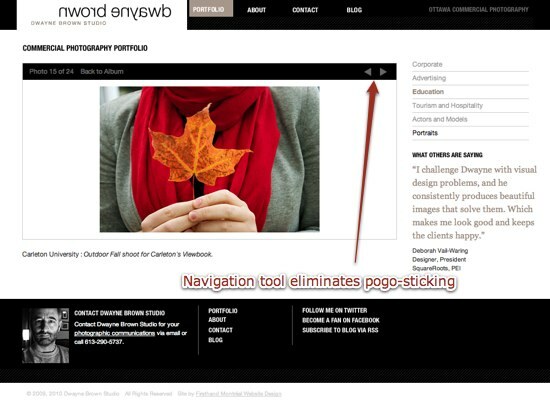 When defining the architecture of a website, I use a customer-centered design approach. A customer persona, a fictional representation of the target audience for your website, is defined. In this case, it was Helen Brightman, a communications manager for a private school in Ottawa. 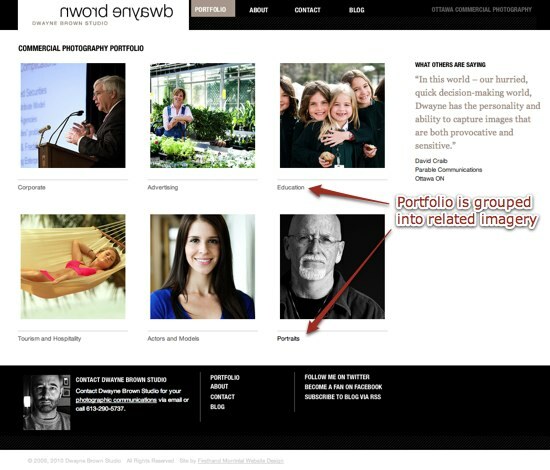 The key task for Helen is to navigate the portfolio to identify photos related to education. 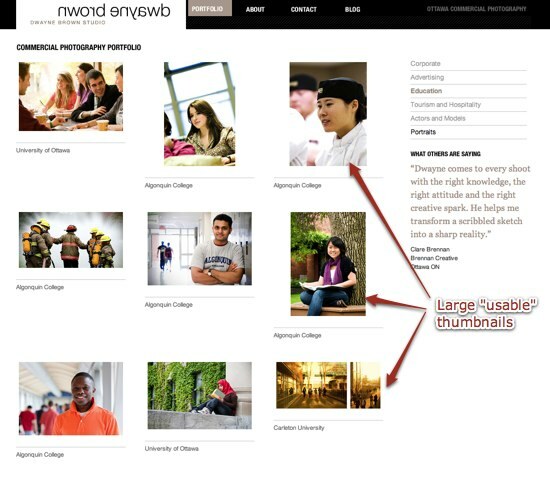 Online photography portfolios are often poorly designed. They suffer from overly “creative” navigation tools, small or abstract thumbnails, and no captions, making it difficult for people like Helen to identify relevant imagery. Even Dwayne’s previous website suffered from some of these issues. Using an agile development technique know as Do The Simplest Thing That Could Possibly Work, I focused my efforts on creating a simple portfolio that was easy to navigate. By identifying the key tasks of your customer, you can focus the web design process on what really matters and avoid “creative” solutions that just don’t work for your target audience. Testing with chained named scopes that have complex attributes such as conditions can be tricky. I try to combine named scopes with clear names to communicate intent, rather than have long chains floating around in code. This can be done simply by creating a plain old method, with scoped procedures or this hack. This is a good way to keep named scopes DRY when using a specific combination across your application code. Of course you should test your named scopes. Product.printable.find(:all, :select => "DISTINCT products.page_number"). The printable named scope is quite complex and has been tested. I wanted to avoid duplicating test data (although factories would help here). For this method I was only concerned about a collection of products and it's page numbers, not that fact it was scoped. But it is a requirement that the products are scoped to only those that are printable. Stubbing and setting expectations help us simplify the test and express the requirement. By stubbing the named scope and returning the Product class we can focus on creating test data for which we are concerned -- products with page numbers. The expectation "find printable products", ensures that we have scoped products as required. Although setting this expectation increases coupling to the implementation, we are justified in that it expresses the requirement in the test example.